After a very pleasant and successful visit to Burlington, it was time to head back down I-89 to New Hampshire, which gave us a good excuse to stop by and check out Prohibition Pig. Like my previous review of Church and Main, Prohibition Pig is a joint that rose of out the ashes of another well-regarded restaurant. In this case, Prohibition Pig replaced the well-loved Alchemist Brewpub, which after the damages of Hurricane Irene, decided to close the brewpub and focus on their nearby brewery/cannery (which produces the well-regarded Heady Topper). 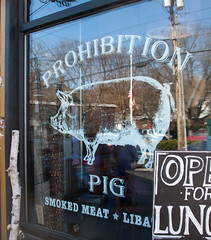 The Brewpub was sold, and thus Prohibition Pig was born. Prohibition Pig keeps much of the same focus on beer that The Alchemist did, instead bringing in beers primarily from nearby breweries… and doing a good job at it. Choices during our visit included beers from Lawson’s Finest Liquids and Hill Farmstead, both top-notch VT brewers, and even some Peche Mortel from one of my favorite Quebec brewers, Dieu du Ciel. But the motto of Prohibition Pig is “Smoked Meat and Libations”, and they pair their excellent bar with a menu focusing on local meats, primarily with smoking and curing. The result is that the restaurant’s new incarnation still packs people in, and we even found the place fully busy during what I call the “lupper” period (the doldrums between lunch and supper service). I found a rather lot to like about Prohibition Pig. 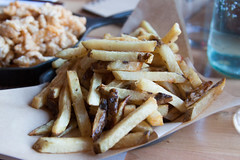 After enjoying our opening round of Lawson’s and Hill Farmstead beers, we decided to order up some appetizers, and two items jumped out on the menu: duck fat fries, and pork cracklins. 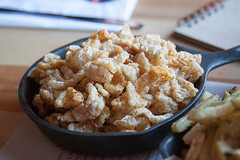 While duck fat fries seem to be the “potato fad du jour”, I’m quite frankly not used to seeing cracklins on menus, particularly this far north of the Mason Dixon line, so we had to order them up. I’ll have to say that the cracklins were indeed quite the success. $5 gets you a fairly large skillet of poppin’ fresh (literally: served in a still-hot skillet, a few of the cracklins were still popping enough to pop out of the skillet), these were probably the best cracklins I’ve ever had. Crisp. Light. Melt-in-your mouth. Not greasy at all. These were everything that bagged pork rinds from the convenience store aren’t, and one that I’ll happily come order again. That said, if I order them again I’m ordering them with less spice, since the salt in the spice mix was a bit strong. But not enough so to detract from an otherwise perfect dish. The duck fat fries, however, were something of a disappointment. As I mention above, duck fat fries in the last few years have started to show up on menus everywhere, and I’m often finding that the novelty value of offering them up in duck fat gets overwhelms the fundamentals of good fry cookery: a crisp exterior and a fluffy interior. These fries didn’t quite have that: they came out with a nice, crispy appearance and smell, but digging into them, the texture was more waxy than fluffy. At first I thought this was the use of the wrong potatoes, but these were Kennebecs, which generally do quite well as fries, so I’m going to guess that these just were parcooked enough. A bit of a shame, since these had potential to be great fries. Until then, I’ll do most of my fry munching down at Worthy Burger. Moving on to the entrees, we again found things hit and miss. I’ll start with where things went well. 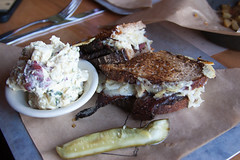 My entree was the house special (a reuben with house-smoked pastrami), and that dish was a solid success. The pastrami was fairly unique: this was a drier pastrami than most I’ve had, but still tender and very flavorful, with a very rich smoke layer penetrating into the meat. I’m always a bit suspicious of anything even BBQ-like in New England (I generally believe that the phrase “New England BBQ” should be met with suspicion, if not outright fear), but the house pastrami was quite nicely done, enough so that I’ll actually have to try some of the barbecue menu items next time I come, since this place shows potential. The pastrami also worked well in the sandwich with some house-made sauerkraut, and served up with a pleasant potato salad (of the kind that actually features the potatoes, and not the typical “potatoes hiding in an egg and mayo salad” that most places have), and this was more than enough to make up for the lackluster duck fries. However, Carol’s luck wasn’t as good. 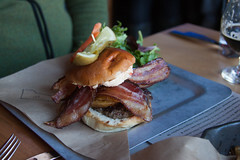 She wasn’t sure whether to try the pulled pork sandwich or the burger, and opted for the House Burger, which is served up with pimento cheese, grilled cippoline onions, and house-made bacon. Some of this worked: the bacon, for example was top-notch, and Carol said she’d love having a sandwich made of nothing but that bacon. The pimento cheese was pleasant as well. But the cippoline onions just didn’t work here, they were fried up just to the point of being gummy, and didn’t really add anything (particularly flavor-wise). And the burger itself was somewhat smaller, and rather overcooked, and seemed to be an afterthought to the rest of the toppings. A great hamburger starts with a good patty, and this wasn’t it. So in the end I found Prohibition Pig to be a mixed bag. They’ve got some serious talent there: both the cracklins and pastrami were top-rate, enough so to draw me back the next time I’m in the area. The beer list was quite good (and the cocktails also looked promising), and the space nice. But along with everything they are doing well, there is a lot of room for improvement here. I hope they are able to kick things up a notch by the next time I visit. I love ProPig – great atmosphere and an awesome place to bring a group of friends. While the wait can be ridiculous, the food – especially the specials – is tasty. Hope you have better luck next time!